Very nice shot. I love having the bicycle in where it is. Did you try doing it with the steeple off-centre? Wow, simply a stunning place… very nice! That is fantastic, I surely have to visit this someday. Very strong shot and comment below…for some people is life more sad than can we believe. Visitors in front of screen would thing about it thanks for your photos. Dr.
Beautiful, simple and more than just a little surreal. The story behind "Drowned church in Graun, Italy"
Last summer I was cycling across Italy and the Alps, and when I finally reached the top of the Reschenpass, suddenly the fog cleared a bit to show me this strange scenery. Apparently it was a well-known tourist spot, but with the constant rain, there were few tourist. The tower is all that remains from the small town of Graun, Italy/ South Tirol, a result of the need for electricity. That story begins when, between 1948 and 1950, the big Electric Company Montecatini came to this area to make good business out of nature´s power. That is the reason why the company wanted to build a huge dam which buried Graun under water. 500 hectars of cultivated ground and more than 150 houses had been drowned. Lots of families, in spite of the little money the company gave them, had a present with no future. Some moved away, some others tried to build a new life and home in upper Graun, where they still live today. Nature´s wounds have been healed quite fast, but the ones in people´s hearts are still there, in the hearts and rememberings of the ones who saw their home sinking. 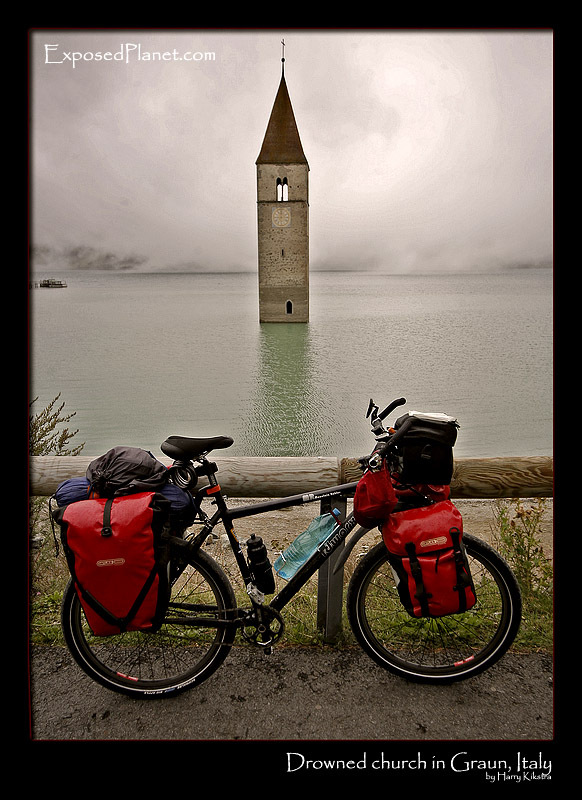 Today, the bell tower is surely a nice spot to take a beautiful pictures, but surely, if you will visit Graun, one thought about what happen will come to your mind and, maybe, you will look down in the Reschen Lake and imagine the town sleeping underneath the water.